This is recipe that is hotly contested amongst my group of friends. Originally, my friend Marissa made this recipe at a party she threw a few years ago. We all loved it, not just because it was so tasty, but also because Marissa’s idea of a party is to have 3x more booze than food. So when she does bring out a few small bites, we all attack like starving wolves and inhale whatever she serves. After that party, my other friend, Emily, asked Marissa for the recipe for these little wonders. Since then, Emily has served them at all of her parties and people have since forgotten that they originally came from Marissa (btw, I don’t think anyone has truly forgotten that Marissa originally made them – I just think that Emily actually makes them better than Marissa did. The meatballs come out lighter, not as dry, and just the right amount of kick). I, in turn, have passed this recipe along to my family and they all refer to it as “Emily’s Buffalo Chicken Meatballs,” when in reality, it’s actually Marissa’s. Confusing, I know. Just don’t mention this to Marissa. The point is that this is one very tasty recipe and you don’t need to be on a CKD diet to appreciate it. In addition to serving it at parties as an appetizer, I also make it for dinner (and serve it over rice) and you can freeze it. If you like buffalo sauce at all, you will love this. Preheat the oven to 450°F. Drizzle the vegetable oil into a 9×13-inch baking dish and use your hand to evenly coat the entire surface. Set aside. Combine the butter and hot sauce in a small saucepan, and cook over low heat, whisking until the butter is melted and fully incorporated. Remove from the heat and allow the mixture to cool for 10 minutes. Combine the hot sauce mixture, ground chicken, egg, celery, and bread crumbs in a large mixing bowl and mix by hand until thoroughly incorporated. Roll the mixture into round, 3/4 -inch balls, making sure to pack the meat firmly. Place the balls in the prepared baking dish, being careful to line them up snugly and in even rows vertically and horizontally to form a grid. The meatballs should be touching one another. Roast for 15 to 20 minutes, or until the meatballs are firm and cooked through. A meat thermometer inserted into the center of a meatball should read 165°F. If serving at a party, keep warm in a slow cooker. Melt butter in a medium saucepan. Reduce heat and whisk in tomato paste, brown sugar, vinegar and lemon juice. The holidays can be one of the toughest times of the year for me. While my family attempts to serve at least a few dishes that fall in my diet, the reality is there’s always a lot of food that’s high in salt, has nuts or beans or dairy, and isn’t good for me. But my philosophy is to always make sure I bring at least one dish that I cook myself so at least I know I can eat something. And of course, to me, the best part of any holiday meal is generally the sides. Green Bean Casserole is a classic recipe from my parents’ era. Who doesn’t love a dish with fried onions on top? Historically, this recipe is made with condensed soup, green beans, a lot of additional salt, and those amazing crunchy onions. So this year, I found this recipe from Alton Brown for homemade Green Bean Casserole and attempted to update it to fit my diet. The results were fantastic – it smelled, tasted, and looked just like the original! Preheat the oven to 475 degrees F.
Combine the onions, flour, and salt in a large mixing bowl and toss to combine. Coat a sheet pan with nonstick cooking spray and evenly spread the onions on the pan. Place the pan on the middle rack of the oven and bake until golden brown, approximately 30 minutes. Toss the onions 2 to 3 times during cooking. Once done, remove from the oven and set aside until ready to use. Turn the oven down to 400 degrees F.
While the onions are cooking, prepare the beans. Bring a gallon of water to a boil in an 8-quart saucepan. Add the beans and blanch for 5 minutes. Drain in a colander and immediately plunge the beans into a large bowl of ice water to stop the cooking. Drain and set aside. Melt the margarine in a 12-inch cast iron skillet set over medium-high heat. Add the mushrooms, 1 teaspoon of pepper and cook, stirring occasionally, until the mushrooms begin to give up some of their liquid, approximately 4 to 5 minutes. Add the garlic and nutmeg and continue to cook for another 1 to 2 minutes. Sprinkle 2 tablespoons of flour over the mixture and stir to combine. Cook for 1 minute. Add the broth and simmer for 1 minute. Decrease the heat to medium-low and add the rice/almond milk. Cook until the mixture begins to thicken, stirring occasionally, approximately 6 to 8 minutes. If you find that it still isn’t thick enough, add 1 more tablespoon of flour, but make sure to mix it in so it cooks off quickly. Remove from the heat and stir in 1/4 of the onions and all of the green beans. Top with the remaining onions. Place into the oven and bake until bubbly, approximately 15 minutes. Remove and serve immediately. About a year ago, I went over my friend’s apartment for her annual anti-Valentine’s Day gathering, which basically entails about 15 girls determined to enjoy Valentine’s Day via friends, booze and snacks. It’s really just a reason to get together and drink. Of note: my friend who has hosted this bash in the past now has a boyfriend (yay!) so we’re going to have to plan around her this year. One of the dishes that she made was Giada DiLaurentiis’ Pea Pesto Crostini. Knowing I’m on my diet, she showed me the list of ingredients before offering me one (I have great friends). Because of the parmesan and salt, I couldn’t eat it, but looking at the list of ingredients, it gave me some great ideas. I realized I could make my own version and infuse some new flavors. And so, I give you a slightly revised version of Giada’s Pea Pesto Crostini. Roughly chop the mint and place in a food processor, along with the peas, garlic, and ground pepper. Pulse together. With the machine running, slowly add the oil until well combined, about 1 to 2 minutes. Add the juice of the lemon and pulse a few more times. Season with additional pepper as necessary. This can be put on a crostini (as the original recipe calls for) or can be added on top of meat or fish. Or as a simple dip with crudite. It’s delicious so however you choose to eat it, I hope you enjoy! One of the greatest loves of my life is potatoes. I’ll take them in any shape and form – fried, shredded, mashed, waffled – you name it, I’ll eat it. Unfortunately, potatoes are very high in potassium and are my no-no list. But I’ve found an alternative…cauliflower! Cauliflower is like the new kale. It’s trendy and you see it everywhere, not necessarily as the original vegetable, but rather, cut up, shredded, diced, etc. It now takes the place of traditional carbs like rice or noodles. But it also works great in place of potatoes! Now, if you haven’t had rice cauliflower or any of these other forms of cauliflower carbs, I will forewarn that it doesn’t exactly taste the same. It does taste a bit like…well…cauliflower. But that’s not a bad thing and in face, after a few bites, I find it tasty in its own way. And the good part is that it has the same consistency of a potato and when you add spices and other yummy ingredients, it no longer has the same cauliflower taste. 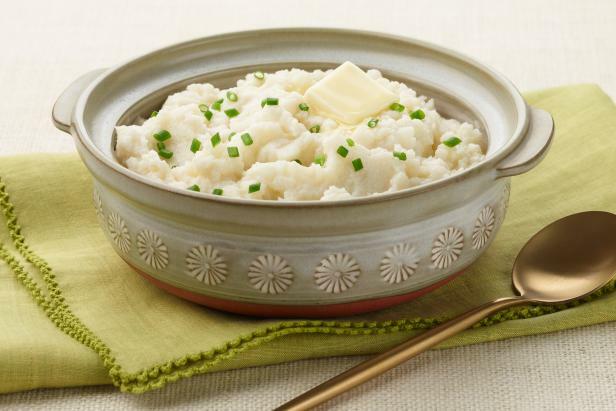 Here is a recipe for cauliflower mashed potatoes from the Food Network, which again, I’ve altered per the below instructions, to make it CKD-friendly. This is delicious, healthy, and an excellent side dish, even if you don’t have CKD. Set a stockpot of water to boil over high heat. Clean and cut cauliflower into small pieces. Cook in boiling water for about 6 minutes, or until well done. Drain well; do not let cool and pat cooked cauliflower very dry between several layers of paper towels. In a bowl with an immersion blender, or in a food processor, puree the hot cauliflower with the cream cheese, sour cream, garlic, chicken bullion, and pepper until almost smooth. Garnish with chives, and serve hot with pats of margarine. Note: My changes to this recipe were to essentially add more spice and make it smoother. I punched up the garlic an added some sour cream (and replaced margarine vs butter). If you don’t like it super garlicky, make sure you select a smaller-sized clove. Also, if you want to save time, feel free to buy the “riced” cauliflower but make sure to read the label to see if there are any additives (like salt)! As you will see, I love salsa. I have a ton of salsa recipes because A.) they’re super easy B.) they’ve got a nice kick of spice and C.) I’m a fan of any type food where utensils aren’t required. Most salsas that you buy from a grocery story have a lot of salt or fruit/veggies that aren’t great for me, but after experimenting a bit, I realized that I can successfully make my own. So over the past 3 years, I probably have attempted to make over 20 varieties of salsa (I’m only posting the successes). Yes, I know – I’m salsa crazy. This one in particular was inspired by the fact that I made a tortilla soup for dinner one night but needed something on the side. I started to make a salsa to blend in with the Mexican theme but realized I could really use a protein. So instead of adding chicken or shrimp to the soup, I just put it into the salsa. And the combination was AMAZING. A note about shrimp: I love shrimp but they’re tricky for me because while they’re acceptable on the CKD diet, they are higher in sodium. So when I use them, I try to use them sparingly. This recipe is great because I can chop up a few shrimp and make a little go a long way. Also, I highly recommend that if you’re going to cook shrimp, you buy the raw ones. They can be frozen or fresh, but they’re so much better when they’re not pre-cooked. You can add whatever flavor you want and they cook to be much more tender. Also, if you don’t like spice, you won’t like this recipe (or the rest of my salsas). That said, feel free to add as much or as little spice as you want – you can make this mild or super hot, but you need to be comfortable with a little heat. Make sure shrimp are thawed and cleaned prior to cooking. Once they are ready, heat the canola oil in a pan over low heat. Place the shrimp in. Keep an eye on them as they cook very quickly. After about 3-4 minutes, flip them to cook on the other side. While they are cooking, take one of the limes and zest it over the shrimp. Cut the lime and squeeze half of it over the shrimp. Allow it to cook all the way through so it’s a light pink throughout and there aren’t any clear parts. It should be a total of around 5-6 minutes. Pull the shrimp off the pan and allow them to cool. While they’re cooling, chop all of your ingredients – the jalapeños, red onion, cilantro, and avocado. Place in a large bowl. Once the shrimp have cooled, remove the tails (throw them in the trash). Chop up the rest of the shrimp into bite-sized pieces. Add this to the bowl. Squeeze the other half of the lime into the bowl, as well as the full remaining lime. Add the agave syrup/honey. Mix together. Take a bite to assess the level of heat and if you need to add more or less. If it’s too spicy, add more agave/honey. If it’s not spicy enough, add another jalapeño. This is a recipe where if it sits in the refrigerator for a few hours, the flavors all meld together and it gets better, so I also recommend trying it again later. Enjoy this on its own as a dip or as a topping for a salad. Or maybe on a corn tortilla. YUM!